Our holiday party print contest winner was Lana Macko (see post here), but the 2nd-place photo deserves a spot as well. So here’s the story behind this incredible shot. 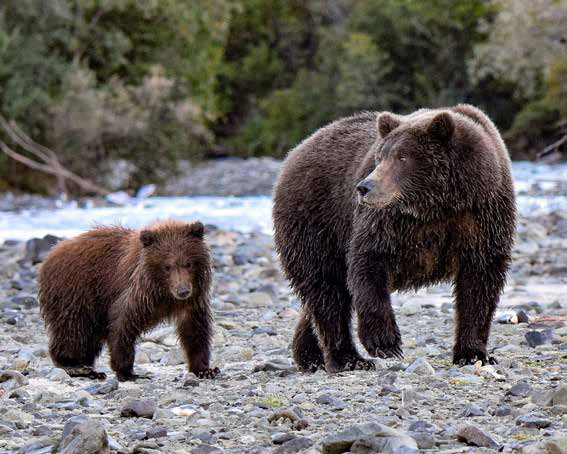 This picture was taken on the Katmai Peninsula south of Anchorage, Alaska, as part of a Grizzly Bear Viewing Photography tour. Our group included eight photographers plus a guide. To reach our photography location, we waded across a creek wearing chest waders. On the first day in Geographic Harbor, we counted more than 20 bears feeding on the salmon within 100 yards of our location. We had several bears come as close as five or six feet from our group. But I was never afraid because the tour guide was extremely competent and made it clear what we needed to do to be safe. This little cub caught my attention because she looked so sweet and dependent on her mom, who was obviously very protective. We shot the photos from a camera mounted on a tripod using a Nikon D7200 with an 80-400mm Nikon zoom lens.